Living in Germany, even though I have lots of opportunity, I don’t often go on shopping trips. It’s just not in my genes, but there are some products that you just can’t say no to and I would definitely put Polish pottery into that category. I usually prefer touring to shopping, but I do love a good hunt. That’s why Poland is such a fantastic destination, and why Wroclaw is my favorite city in the entire country, and maybe even in Europe! However, anywhere you go around the world is full of boutique shops selling quaint country crockery will have a shelf or two of Polish stoneware. With its signature blue and white patterns, it’s easy to mix and match and find pieces to adorn your classic country kitchen table. 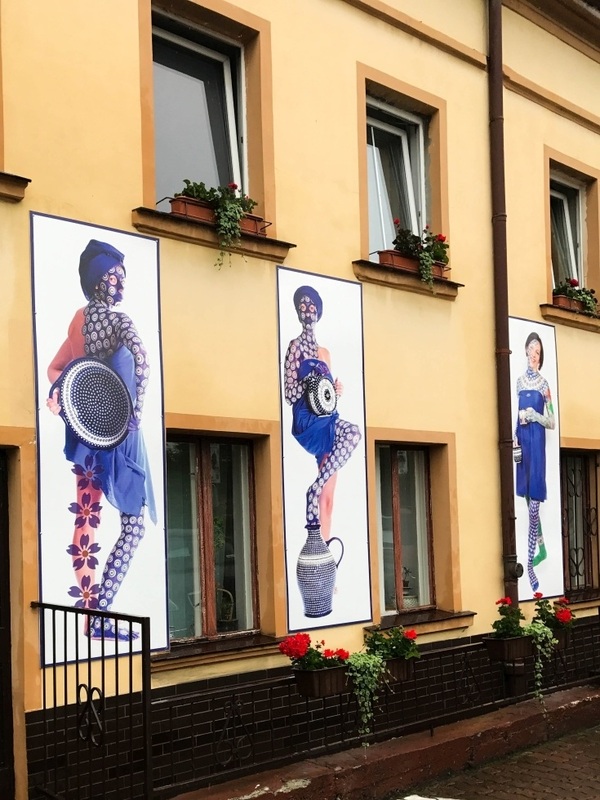 So, we headed off to Boleslawiec, a cute little town in southwestern Poland where the rich, clay deposits have yielded Polish ceramics for over a thousand years. 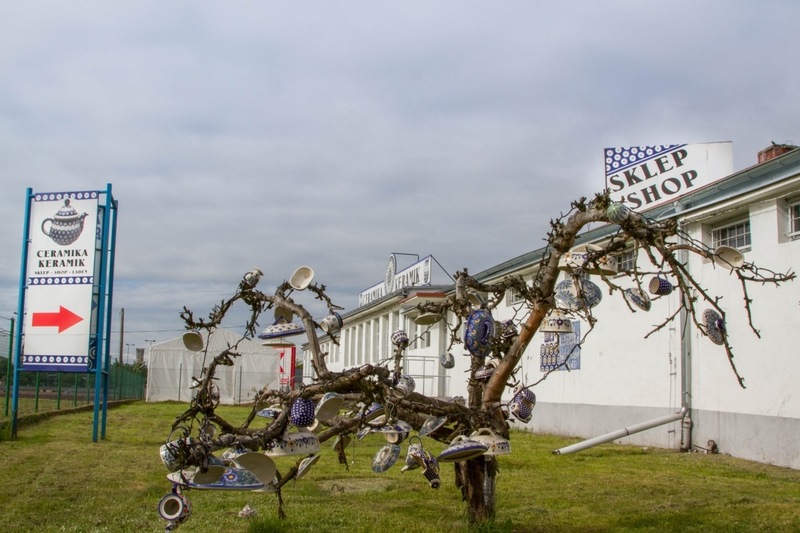 Pots hang all over a tree advertising the traditional patterns of Polish stoneware. The important thing to know before you make any purchases is that all the pottery is inspected and is usually stamped with a quality stamp on the bottom. It goes without saying that you want the highest quality which is marked GAT 1. Depending on your aesthetic sense, you can also probably get away with a GAT 2, because it is only a painting error, not a structural error. Anything less than GAT 2 will be cracked, chipped, and basically you wouldn’t want to eat off of it. If you have questions about it, don’t worry there is somebody in each outlet that speaks English pretty well. They will tell you that their pottery is okay to put in the oven, microwave, and dishwasher. I’ve done all three with no problems. If you are at all interested in the process the pottery goes through, you can watch this fantastic video. 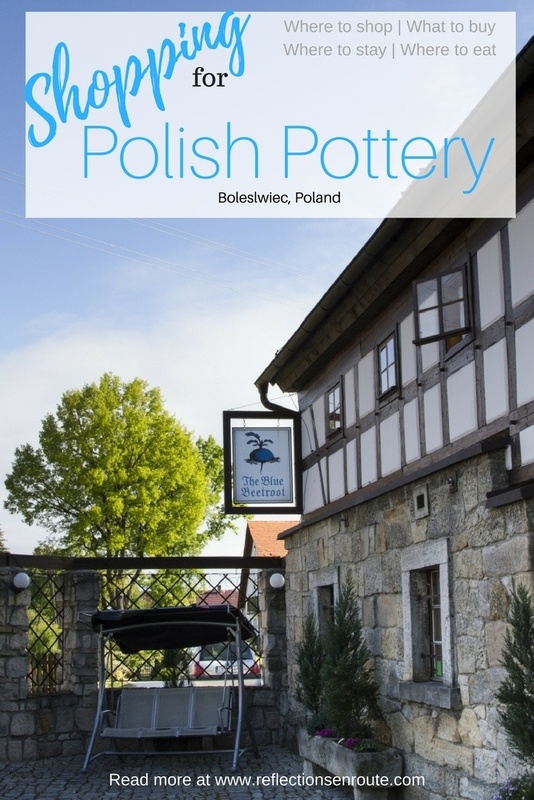 Many outlet shops can be found in this little-known Polish Pottery capital, Boleslawiec. Most of the pottery shops in Boleslawiec will take credit cards or cash. They’ll wrap and box up your newly acquired treasures so you can get them safely home. Alternatively, they will ship your items internationally (for a fee of course). With all of the different shops and the services they offer, there’s no reason you can’t get what you’re looking for. 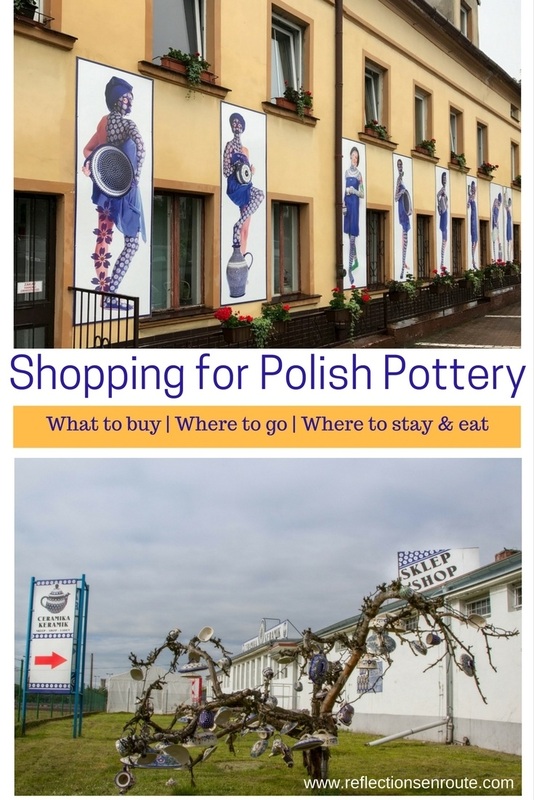 However, if you can’t get to Boleslawiec, why not shop from the comfort of your own home on the online Polish Pottery Market? Car: The absolute best way to get to Boleslawiec is by car. Not only is it a little off the main tourist trail, you can buy a lot more Polish stoneware with a trunk or empty back seat. 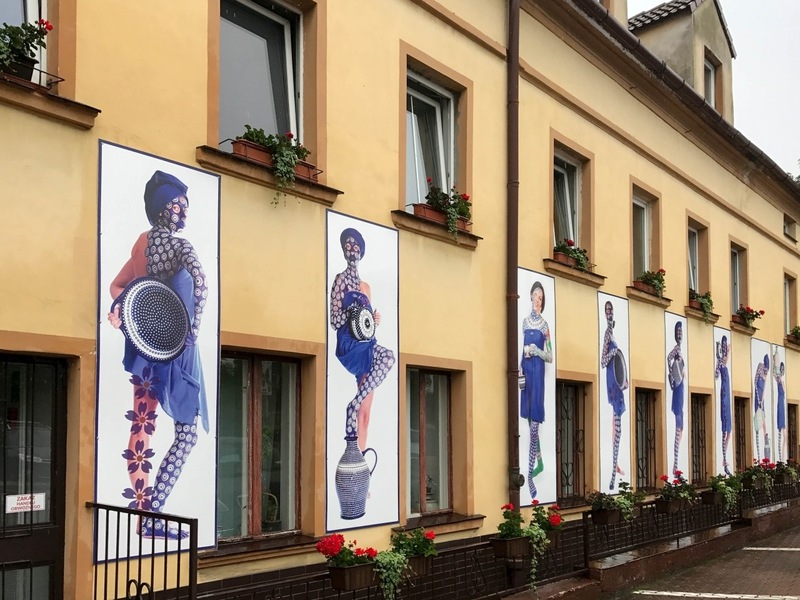 Boleslawiec is located close to the German and Czech borders, so for folks living or working in either of these two places, it’s a quick jump. The nearest Polish cities are Wroclaw, one of my favorite cities to take kids, as well as Poznan. 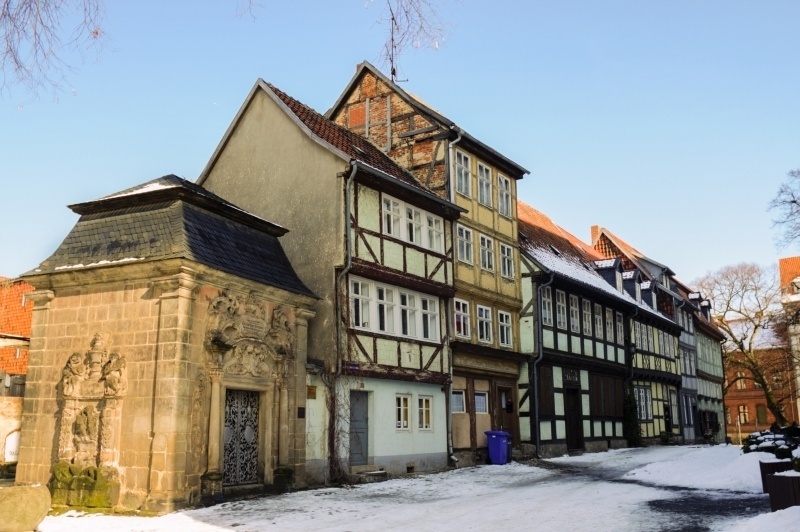 It’s also pretty close to Dresden and Leipzig in Germany, or a couple hours from Prague, Czech Republic as well. Train: You can get to Boleslawiec by train, but all tracks go through Dresden, and it’s a 2.5 hour train ride from there. Once you are in the town, you will need to hire a taxi to get around. 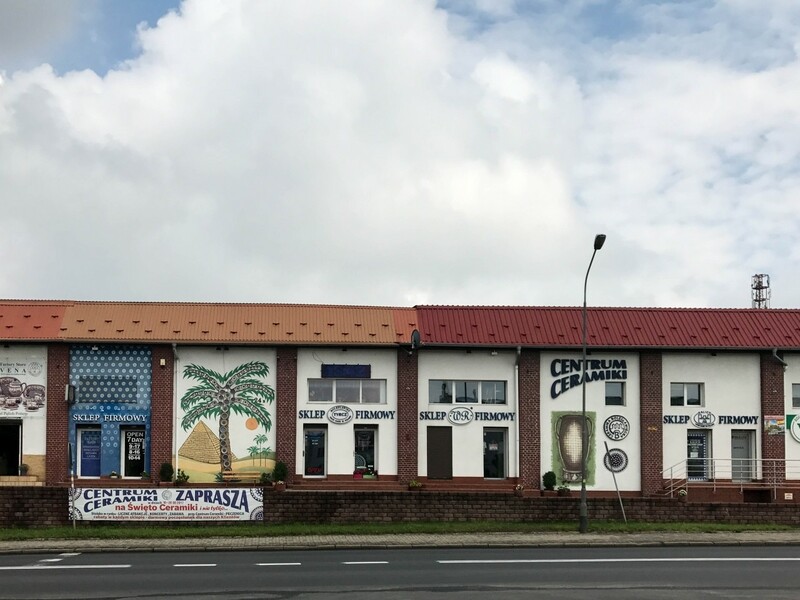 There are plenty of excellent Boleslawiec hotels at very affordable rates, but my favorite is the Blue Beetroot, run by a British couple who know the area well and will tell you all the great places to go and things to see. The building is a renovated barn and is charming inside and out.The hotel also has a fantastic restaurant and I would highly recommend the spinach perogies with garlic sauce. Yum! Where to eat: Again there are wonderful restaurants all over town, those that serve typical Polish fare as well as your pizzerias and other fast food. One of our favorite places to eat is the Opatkowa Chata. Try the fried potato pancakes with a warming serving of goulash, delicious! Kids? I’m not sure taking kids is the best thing to do on a shopping trip where everything is breakable, but in saying that, I did. We found that a few of the shops have places for the kids to sit and color and the restaurant had a nice little playground out back. There are stores and outlets galore in Boleslawiec. The first time we went, we were overwhelmed and a little burnt out after about three solid hours of shopping. We picked up some great items, like my teapot with heating stand, a couple of beautiful serving dishes and even a muffin pan, but what I like and what you like may be different, so I’ve listed and linked many of the stores below, the ones that I could find websites. This way, you can peruse the patterns before you go and start out with a plan. I wish we’d done this, because we weren’t sure if we should buy this cup here or that spoon there. Would there be something better at the next place? Hopefully, with a little advance work, you won’t be so overwhelmed. This is part of our haul from our weekend shopping trip to Poland to buy some amazing Polish ceramics. When you go to the website, check out the Polish pottery dinnerware, the discounted Polish pottery, and then check out the contact page which will tell you exactly how to get there. Many of the websites have an email address on their contact page as well, so if you have any questions before you go, just send them a message. Have you ever gone on a weekend or day trip just to shop? 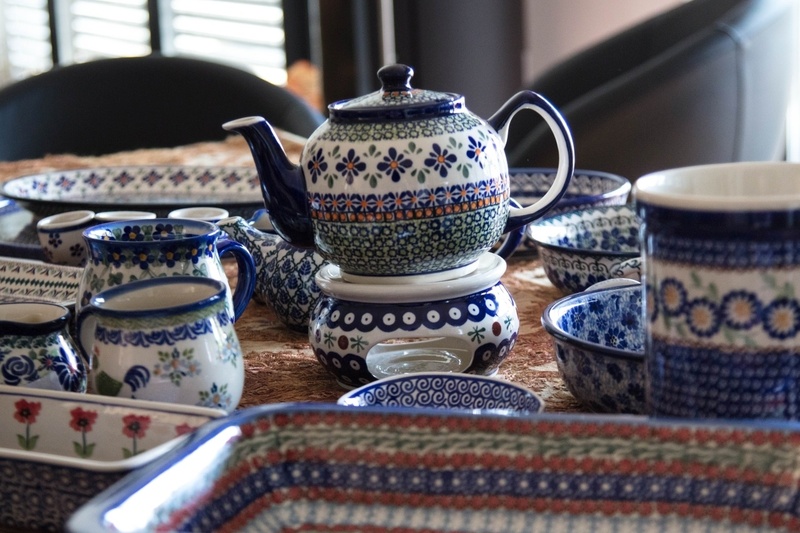 Have you been Polish pottery shopping? Got any tips? Pin Boleslawiec Polish Pottery for later! Yes, I love pottery as well. Thanks Hieu Hoang for your comment. Shere, So true. The Dutch, Delft-type pottery, is completely different than the Polish pottery. I would say the Polish ceramics are much more country kitchen-y. Wouldn’t you? The Polish pottery made it all the way to Los Angeles (lol). I’ve seen many of these pot patterns in some of our stores. It’s lovely, however. 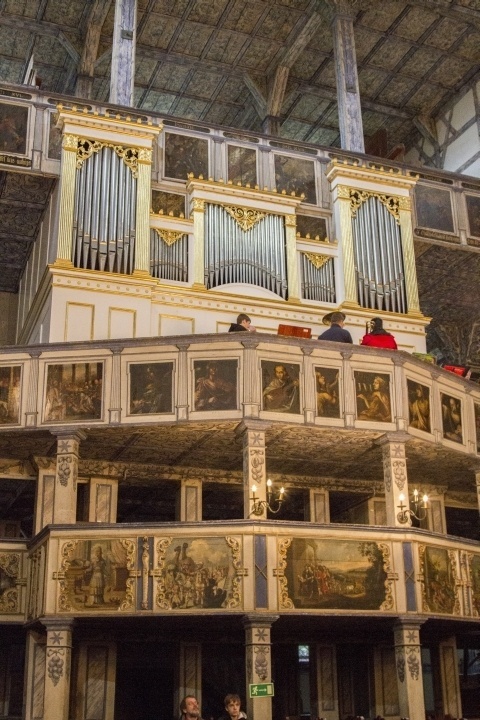 Anda, Oh, I know it has, but let me tell you…it’s much, much, much cheaper in Poland! Michelle, Yeah, but Poland has plenty of places to offer free and fun things to do. I like the photo of the pottery sculpture. I didn’t know that Poland was famous for pottery. I know that they have a number of significant crystal manufacturers. Rhonda, Oh they are well-known for pottery. It’s huge in the States. I love it as well and as you’ve seen, I have plenty of it. 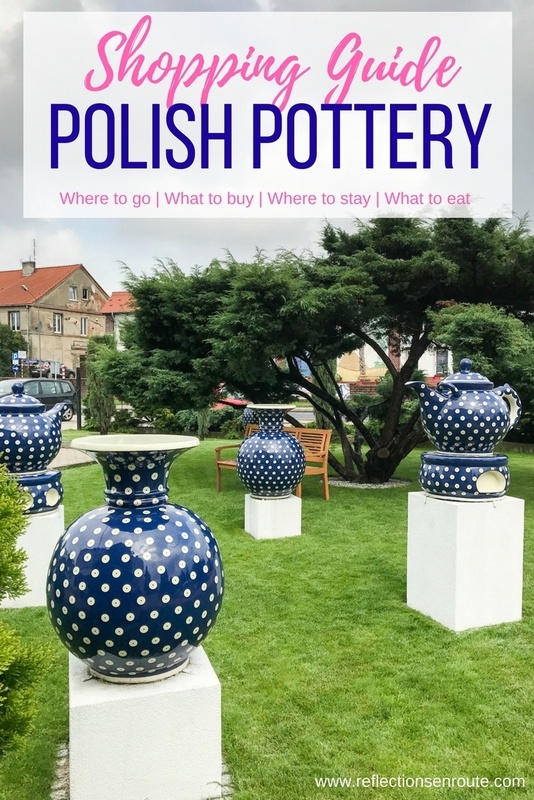 I would love to go pottery shopping in Poland! I love your patterns from your haul. It’s beautiful! I had a friend who was stationed in Germany a few years ago and she did a lot of these Polish pottery shopping during their three years there. I’d be so nervous trying to ship my haul back to San Diego though. Mary, Luckily the shops will pack and ship your stuff for you back to the States. Cheryl, Each shop is different so you have to ask them when you are there or order online. 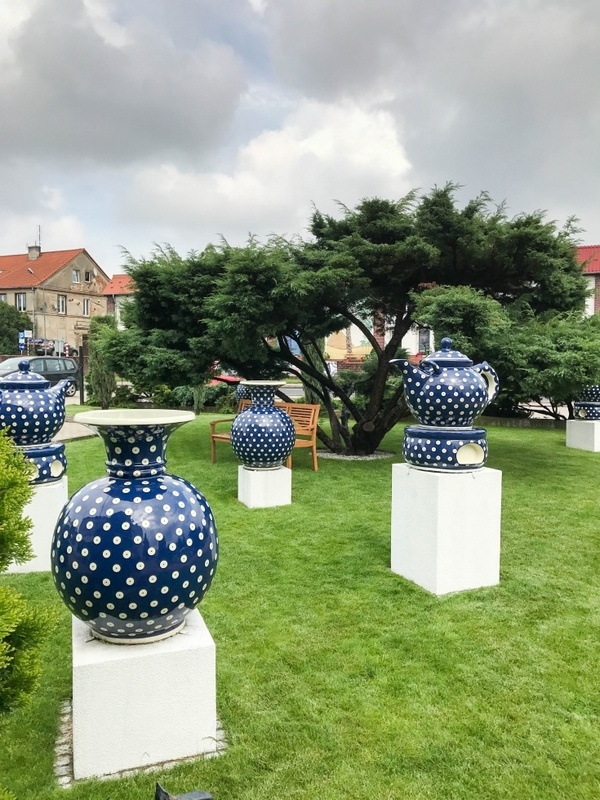 The three times I have been Polish Pottery Shopping in Boleslawiec , I always stayed at the Hotel Garden. I can’t recommend this place enough. There are large rooms for 3-4 woman to split (something often unseen in Europe!) and the food is some of the best I’ve had in Europe.